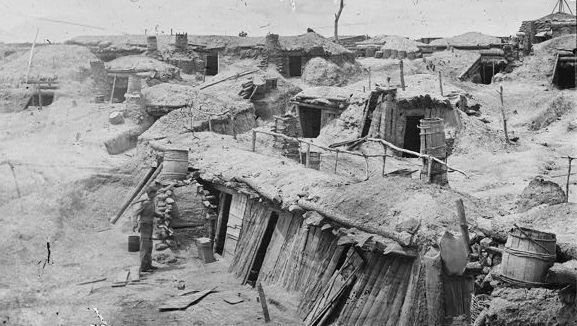 On December 7, 1864, a strong force of infantry, cavalry, and artillery under the command of Maj. Gen. G. K. Warren left the Petersburg entrenchments and marched south along the Jerusalem Plank Road. Their mission was to destroy as many miles of the Weldon Railroad as they could, making it impossible for the Rebels to rebuild, and the task of getting much needed supplies into Petersburg all the more difficult. The infantry was comprised of Warren’s Fifth Corps augmented by Mott’s Third Division of the Second Corps. The other two divisions of the Second Corps, including our friends in Fourteenth Connecticut were not involved in what became known as “Warren’s Raid,” but were ordered to occupy the works vacated by the Fifth Corps. Yours of the 8th inst. reached me this morning and found me roughing it as usual. The 5th Corps and one Div. of the 2nd (3rd Div) have just returned from a raid on the enemy’s communications. We started at daylight last Wednesday morn, taking the Jerusalem Plank road and crossed the “Nottoway” the first night and there camped, making some 20 miles from camp the first day. Started at daylight next morn and marched all day without accident, the 5 corps in advance, camping at night near “Jarratt’s Station.” The 5 corps were busy tearing up the railroad (Weldon) that night, and in the morning we commenced following their example. We have made a complete wreck of the Weldon road for nearly 20 miles, viz. from above “Jarratt’s” to “Hickford” (now Emporia) on the Meherrin river. It would have done you good to see how we destroyed this great artery of rebel life. In the first place we stacked arms alongside the road and the line marched on it and grasping the rails and ends of the “sleepers” on one side, we just turned it right over! Then commenced the work of separating the sleepers from the rails, which was no easy job, for it was a very well constructed road, and of the best material both the iron & wood. Northern “mudsills” soon found a way, however, by means of the Telegraph posts which stood by the road at short intervals. 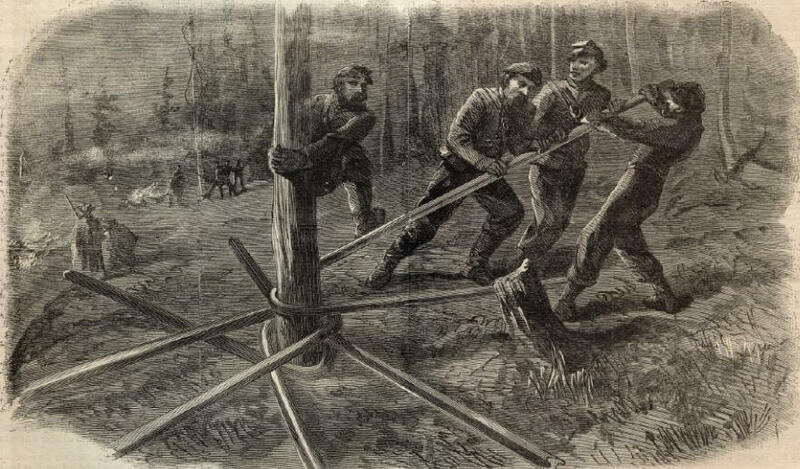 The sleepers separated, we built piles of them, and dry fence rails, which were also handy, and piled the rails across the top of the pile with a short bearing in the center, and set fire to it. The fire burned everything in the wood line, and so heated the rails, that the ends bent to the ground thus rendering them useless. Our boys made short work of it I tell you. But a few minutes elapsed from the time of taking hold until the rails were heating. Coming back, we made clean work of the buildings on the route in retaliation for some of our men who were unable to keep up with the column, being murdered and mutilated. Sussex C. H. went up with all the buildings thereabouts. I enclose an ancient specimen of book keeping, which came from a store near the C. H. I would like to write you a long letter about the incidents of the raid, but have not time. We arrived back in camp yesterday (Monday) afternoon. Remember me to all the family, and friends. Below are four sketches by A. A. Warren of Warren’s destruction of the Weldon Railroad that appeared in the December 31, 1864 issue of Harper’s Weekly. It’s exactly the way Captain Oakes described it. This entry was posted in 1864 - Autumn, General Information, Siege of Petersburg on December 5, 2014 by admin.